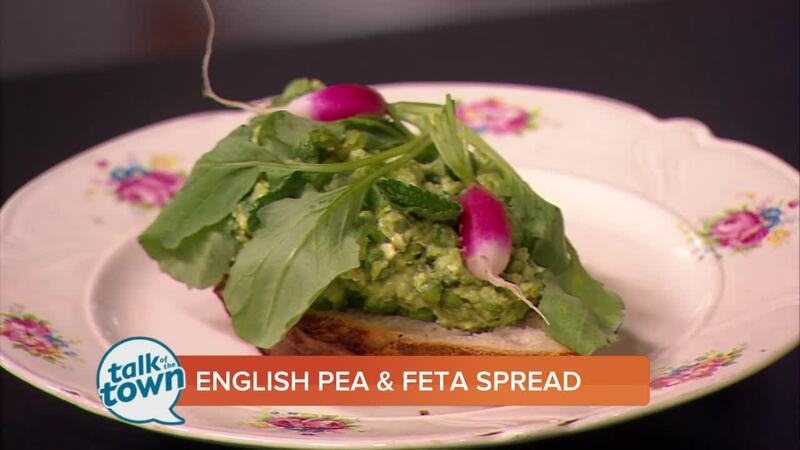 Margot McCormack from Margot's Cafe & Bar made English Pea and Feta Spread with Mint and Lemon and gave a preview of the upcoming Dining Out for Life event. Margot Café & Bar is one of 60 area restaurants participating in the 17th Annual Dining Out for Life event on Tuesday, April 16. Participating restaurants in Dining Out for Life will donate a generous percentage of the day's sales from either breakfast, lunch and/or dinner to Nashville CARES. To view a list of participating restaurants, visit www.DiningOutForLife.com/Nashville . Margot has two restaurants participating in Dining Out for Life, Margot Cafe & Bar (1017 Woodland Street, Nashville, TN 37206) and Marche (1000 Main St, Nashville, TN 37206). They will both donate 50% of their sales on the 16th. Place frozen peas, flat, on a baking sheet on top of a paper towel. Allow to thaw 10-15 minutes. Place half of thawed peas, 1/2 the feta into the bowl of your food processor. Add the minced garlic, shallot and lemon zest. Turn machine on and allow to mix until everything becomes smooth. With the machine running, slowly incorporate the olive oil into the pea and feta mixture. Remove from bowl, scraping all of the mixture out using spatula and place in mixing bowl. Finish with the remain thawed peas and feta. Crumble feta and add juice of lemons. Finish the spread by adding the fresh chiffonade of mint and season with salt, pepper and chili flake. Taste and adjust with more seasoning if required.